My dad bought this wireless mouse at a secondhand store today, but it's missing a 2.4 GHz transceiver. It's my understanding that Microsoft does not sell replacement transceivers. I would check to see if one is available on eBay. Scott. 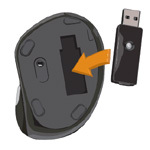 So it wasn't in the bottom of the mouse?